Tricept T9000 is equipped with an unique and patented Direct Measuring System. This system is based on a combination of the Tricept standard parallel kinematic positioning system and a traditional Cartesian positioning system mounted on the centre tube and its suspension. These two systems compare the X-Y-Z positioning values during operation in real time. 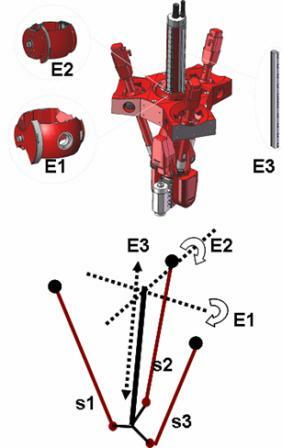 The DMS consists of three encoders that directly detect the movement of the central tube around the central upper gimbals of the robot (measured by encoders E1 and E2) and its displacement along the linear encoder E3 (Fig. 1). 1. 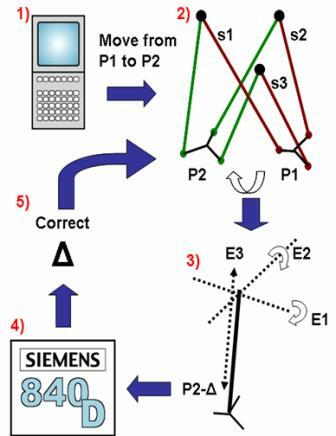 The operator (or the program) commands the robot to move from position P1 to P2. The control acts over the active links (the struts) s1, s2 and s3 (as shown in Fig. 2) to get to the desired position. 2. Once the actuator lengths have been reached, the passive link (central tube) encoders E1, E2 and E3 are read. Calculating the TCP position though these encoders (avoiding the complicate calculations through the parallel kinematic structure) gives a new P2 position, with a Δ error. 3. This error is analyzed by Siemens 840 control and commands the actuators s1, s2 and s3 to move accordingly to correct this error. It is important to realize that the measure obtained from the DMS system is much more precise (due to the high quality encoders used) that the one given by the encoders of the motors. 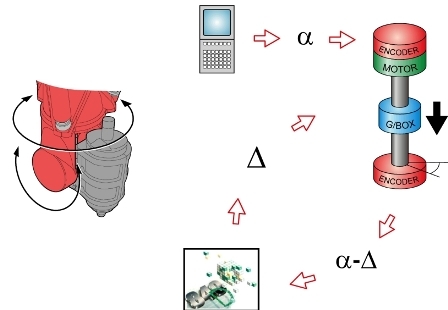 Therefore, the positioning of the Tricept is driven by these encoders. A similar, double measure system, is implemented in the rotation of the wrist. This system is called WMS (Wrist Measuring System). The encoders in the WMS control the actual position of the rotary axes by means of external encoders mounted directly on the moving parts of the A and C axes. The way WMS works in the control is similar to the DMS (Fig. 3). The WMS encoders read the direct position of the axis 4 and 5 rotation (bypassing the motor, transmission and gearbox links) and compare it with the values obtained from the encoder motors. A Δ value is also computed here and the wrist motors are commanded to correct TCP position. The DMS and WMS increase the stiffness and accuracy of the machine, and they also compensate for a lot of the effects of cutting forces and temperature changes. DMS system is available by default in the tricept T9000 & T805 and as an option in tricept T605.